When choosing the best children’s bedroom decor suited to your child, you have to take into consideration comfort, as well as what they like. Why Do You Need Children’s Bedroom Decor? Dependant on the age of your child, the budget for their bedroom may be slightly different. Newborn bedroom designs are very simplistic and usually are pink, blue or beige. The only costly parts of their bedroom decor are the cot, wardrobe and other decor essentials; you can keep it very minimalistic. At the age of a toddler is when your children will perhaps begin asking to decorate their bedroom. Simply because they look at storybooks and see images of princess bedrooms and superhero lairs. This can influence your child on how they want their bedroom to look. Although decorating your child’s bedroom can be costly, it doesn’t have to be. There are plenty of fun decor ideas out there which you can do with a bit of DIY to make it slightly more cost-effective. So if you want to know some cool bedroom designs for your children, we have devised a list of the top bedroom design ideas for kids. So keep reading! A zoo or jungle themed bedroom is a popular choice for both genders. You can do so much with this bedroom design that it’s one of the best bedroom designs to date. Start off with green or cream walls to replicate the jungle or the colours of a desert. If you are very artistic and have experience in home design or know somebody who is, then why not paint animals onto your child’s wall? If you don’t feel comfortable enough to do this then not to worry, you can buy animal stickers online of some of the most famous animals in the wild. If you don’t want to take this approach, purchase animal print wallpaper and match your child’s decor options with fun accents and furniture options. For extra details, add some trees which are either painted or stickers. And complete the jungle/zoo themed bedroom with an authentic wooden bunk bed. We love the ones on Happy Beds. Another bedroom idea that’s suitable for both boys and girls. Everybody loves the circus, perhaps not clowns, but there are plenty of other fun aspects of the circus or the funfair. The design in this fun bedroom design doesn’t have to be very extravagant or complicated. Get red and white bunting and place it around the ceiling of your child’s bedroom to replicate the bunting that is often used in circus tents and at the funfair. If you have any ideas on where else you can use it, then it can be a great design option. If your son/daughter is slightly older, then look for lettering pieces online that you can hang on the wall over the headboard of their bed. Spell out words like “Fun” to flow with the bedroom design. We found some here on The Wooden Letters Company. And the ever so famous princess themed bedroom. A princess themed bedroom is very common; however, you can make unique in the way that you choose to decorate it. A princess bedroom needs a bed that is worthy of a princess; we love this princess carriage bed from World Stores that is the perfect touch to any princess themed bedroom. Paint the princess bedroom pink and pair it with as many pink accessories and mystical picture frames that you can get your hands on. Why not treat your princess to their own dressing table where they can comb their hair and apply makeup. Have your child experience the same childhood as you with a tree-house themed bedroom. Most tree house-themed bedrooms are painted a green or brown, beige colour to replicate the outdoors. If you are good at DIY, then you can construct a wooden platform to put up in the bedroom where your child can have their bed elevated just like in a real tree-house. If this isn’t an option for you, then bunk beds do just the same job and still provide the element of elevation. The comes the decorating part, use fake leaves to stick onto the bunk bed or wooden platform to resemble being up in the treetops. Then you can add your own personalised twist to your child treetop retreat. Why not get personal and purchase a chalkboard and have your child draw ” your child’s name entry only”. This will make your child feel like they have their own personal space and like they have control of their private area. This is one of our favourite children’s bedroom design ideas. A lot of people who choose this bedroom design often choose a room that has had home conversions Towcester as it has different levels and space for underwater decor. You can either choose to have your own approach on the underwater theme, or you can take ideas from the famous underwater adventure film Finding Nemo. Just like the zoo themed bedroom, you can purchase wall stickers of the famous Disney characters, or alternatively paint your own. Paint your walls blue and team it with underwater foilage like rocks and seaweed, and if your feeling very adventurous then why not add a sunken shipwreck. 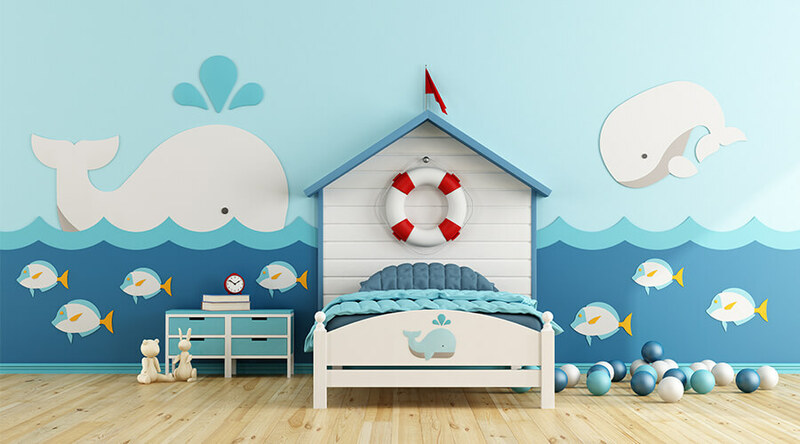 Complete your underwater themed decor with a boat bed so that your child can sail the sea every night before they go to bed. So now that you have some inspiration, it’s time to decorate your child’s bedroom! Always keep your budget in mind and make sure not to overspend, and if you need any building or construction advice be sure to ask builders Buckingham. Ask your child what their favourite design idea is and let them help you decorate, by giving help it just makes their bedroom feel more personal and makes the process fun. We hope that this article was helpful, if it was then why not share on social media?